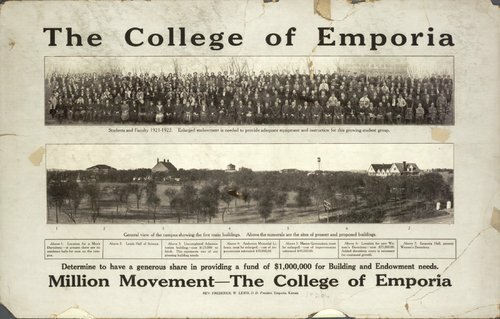 An endowment and building campaign poster showing students, faculty, and a general view of the campus. Several faculty are identified: front row - Shaffner (far left); D. Hirshler (5th from left); Loeffler (11th from left); L. Myers (12th from left); Conrad Vandervelde (13th from left); R. Miller (19th from left); Ray F. Miller (20th from left); President Frederick W. Lewis (14th from right); and T. F. Owen (12th from right). A general view of the campus shows the five main buildings. They are numbered and correspond to descriptions at the bottom of the poster.